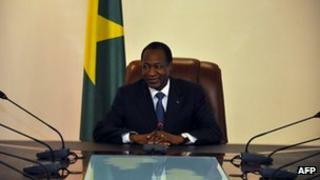 The parliament in Burkina Faso has granted amnesty to President Blaise Compaore and all of the country's previous heads of state. The immunity from prosecution will cover all presidents since independence from France in 1960. President Compaore came to power in a 1987 coup in which popular leader Thomas Sankara was killed. Burkina Faso - formerly called Upper Volta - has spent many of its post-independence years under military rule. The move will also affect former leaders Saye Zerbo, who served from 1980-82, and Jean-Baptiste Ouedraogo, in power from 1982-83. They also came to power following coups. Minister for Territorial Administration Jerome Bougouma told the AFP news agency that the parliament had also adopted a measure to introduce a "moderating" upper house Senate next year. And the parliament decided to set upper and lower age limits for presidential candidates which means they can be aged between 35 and 75. The vote was boycotted by the opposition, which argued that the reforms had been devised mainly to help President Compaore maintain power. The constitutional reforms were proposed last year by a consultative council which was put together by the president after popular protests and mutinies against his regime. Protests first broke out last year over high food prices, unemployment, rising costs and looting by troops. Soldiers and paramilitary police later joined in, bringing unrest to several towns. One of Africa's poorest countries, Burkina Faso has significant reserves of gold, but cotton production is its economic mainstay.